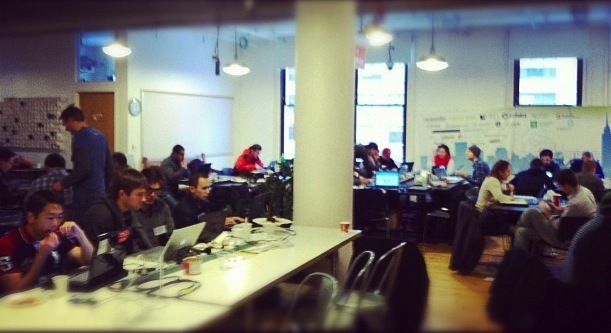 The Cleanweb Hackathon returns to NYC tomorrow, Friday 9/28, at AlleyNYC. I can't make it this time around, but you can read my thoughts on the January Cleanweb Hackathon here. The Hackathon brings together software developers, designers and entrepreneurs to brainstorm solutions to vexing problems in energy, waste, water, energy efficiency and many other issues facing our resource constrained world. Those of you familiar with the Hackathon concept know it is an intensive developer session in which apps leveraging web 3.0, mobile, and social media technologies are built in a little over a 24-hour period. As in previous Hackathons around the country (and across the pond), the teams will be plied and supplied with APIs and pizza, datasets and coffee as they race against the clock to get their app built. On Sunday, the teams will present their apps to a select panel of judges. The Friday night kick-off features a presentation by Mark Grundy of the Carbon War Room to focus developers on solving big issues in key sectors that align with the city's long-term sustainability plan, PLANYC. This event is part of the Cleanweb Hackathon series that was started in San Francisco in September 2011 by Blake Burris and Sunil Paul and later mushroomed into a global movement with Cleanweb communities and events in cities throughout North America, the UK and Europe in 2012. Wish I could be there! Hack-on!